Zebra Paracord Sport and Travel ID Bracelet. 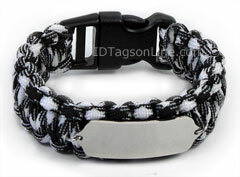 Zebra Paracord Sport and Travel ID Bracelet. Premium Mini Dog Tag with raised medical Emblem. Zebra Paracord Sport and Travel ID Bracelet, IDPR34 (ID Tag size 1-5/8" x 7/8"), features .062" thick premium grade non allergenic surgical Stainless Steel Plaque. It is guaranteed to be rust free for life. We can engrave 5 lines (20 Characters Max. in each line) of personal or medical information on the tag.